H & H Metal Fabrication, Inc. has been in business since 1992 and is locally owned and operated . Located in Northeast Mississippi, we specialize in manufacturing glass storage racks such as windshield racks, picking carts, glass carts & glass racks. 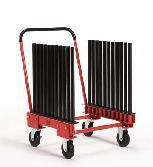 Our newest addition to our product line is our Mobile Rack units (truck racks and van racks). We will continually be adding new products to our product line. If you do not see what you are looking for on our site or need a custom item, please give us a call. NO job is too big or too small! A large percentage of our work is custom manufacturing or prototype work, so we welcome suggestions and designs from our customers. We can work from hand-sketches or CAD drawings. We have been in the welding and metal fabrication business for over 25 years. We have worked 17 of those years in the windshield rack industry; therefore, we have a tremendous amount of experience and knowledge of designing and producing any type of rack or cart for your specific needs. Some of the other type of services that we provide are: welding, metal fabrication, powder coating, and repair work. 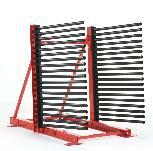 We remain very competitive among the welding and metal fabrication business. Please give us a chance to earn your business, we assure you that your company will be very satisfied with our services.